Relax and unwind after a long day with this handsome contemporary sofa in your home. Sleek track arms with nail head trim and tapered block feet give it a beautiful modern look that you are bound to love. 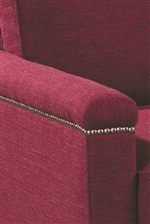 Loose back and seat cushions give this sofa magnificent plushness, making this the most coveted seat in your home. Complete with four throw pillows, this sofa has everything you have been looking for and more. The 7216 Contemporary Sofa with Track Arms by Huntington House at Wayside Furniture in the Akron, Cleveland, Canton, Medina, Youngstown, Ohio area. Product availability may vary. Contact us for the most current availability on this product. After a long day at the office there is nothing better than coming home, sitting down, and relaxing after a hard day. This 7216 collection is perfect for doing just that. 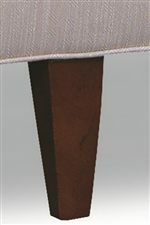 The modern, contemporary look of this collection is seen in the tapered feet, and track arms accented by nail head trim. Plush seat and seat backs cushion you perfectly as you relax the night away. Add this collection to your home for the ideal place to sit and watch TV from in your home. The 7216 collection is a great option if you are looking for Contemporary furniture in the Akron, Cleveland, Canton, Medina, Youngstown, Ohio area. 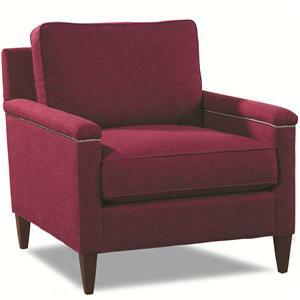 Browse other items in the 7216 collection from Wayside Furniture in the Akron, Cleveland, Canton, Medina, Youngstown, Ohio area.